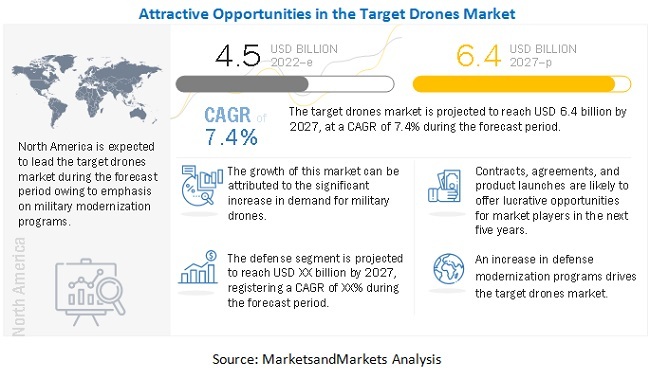 [184 Pages Report] The target drones market is projected to grow from USD 3.79 Billion in 2016 to USD 6.20 Billion by 2022, at a CAGR of 8.55% during the forecast period. The base year considered for the study is 2015, and the forecast period is from 2016 to 2022. The report analyzed the target drones market based on engine type (internal combustion engines, jet engines, and others), end user (defense, homeland security, and commercial), fit (linefit and customized fit), platform (aerial targets, ground targets, underwater targets, and sea surface targets) and target type (full scaled, sub-scaled, towing, free flying and sub-scaled). These segments and subsegments were mapped across major regions, namely, North America, Europe, Asia-Pacific, MENA and rest of the world (RoW). The report provides an in-depth market intelligence regarding market dynamics and major factors, such as drivers, restraints, opportunities, and industry-specific challenges influencing the growth of the target drones market, along with an analysis of micromarkets with respect to individual growth trends, growth prospects, and their contribution made to the overall market. The report also covers competitive developments, such as long-term contracts, new product launches & agreements, and research & development activities in the market. The market size estimation for various segments and subsegments of the target drones market was arrived at by referring to varied secondary sources, such as OMICS International, Bloomberg Businessweek, European Defence Agency, through corroboration with primaries, and further market triangulation with the help of statistical techniques using econometric tools. All percentage shares, splits, and breakdowns were determined using secondary sources and verified through primary sources. All possible parameters that affect the market were accounted for, viewed in extensive detail, verified through primary research, and analyzed to acquire the final quantitative and qualitative data. This data is consolidated with detailed inputs and analysis from MarketsandMarkets, and presented in this report. The ecosystem of the market comprises raw material suppliers, manufacturers, distributors, and end users. Key market players operating in the market include The Boeing Company (U.S.), Northrop Grumman Corporation (U.S.), QinetiQ Group plc (U.K.), Kratos Defense & Security Solutions, Inc. (U.S.), Saab AB (Sweden), Lockheed Martin Corporation (U.S.), Airbus Group (Netherlands), Leonardo S.p.A. (Italy), ASV Global (U.K.), and AeroTargets International, LLC (U.S.). These players have adopted strategies, such as contracts, new product developments, and agreements to strengthen their position in the market. 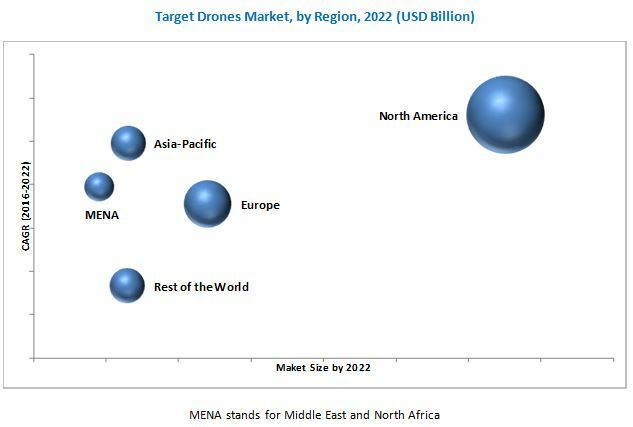 The target drones market is projected to grow from USD 3.79 Billion in 2016 to USD 6.20 Billion by 2022, at a CAGR of 8.55% during the forecast period. The increasing demand of target drones in militaries across the globe is a key factor expected to drive the growth of the market. The market has been segmented based on engine type, end user, fit, platform, target type, and region. Based on engine type, the <>target drones market has been segmented into internal combustion engines, and jet engines, among others. The jet engine segment is estimated to dominate the market in 2016. The high adoption rate of jet engine target drones in militaries, due its excellent maneuvering and high speed capabilities is one the reason for the growth of the segment in near future. Based on end user, the target drones market has been segmented into defense, homeland security, and commercial. Defense is estimated to be the largest segment of the target drones market since target drones are majorly used for anti-aircraft, anti-missile, and anti-submarine military trainings in the defense sector. Target drones are also used for missile and weapon calibration testing. Based on fit, the target drones market has been segmented into linefit and customized fit. The linefit segment is estimated to lead the market, as the customized fit segment is present only in the U.S. and the U.K.
Based on platform, the market has been segmented into aerial targets, ground targets, underwater targets, and sea surface targets. Aerial targets segment is estimated to be the largest segment of the market, since only aerial targets can be used for anti-aircraft, anti-missile military trainings and missile calibration testing. The trainings are performed by all segments of armed forces, such as air force, navy and military. Based on target type, the market has been segmented into full-scaled, sub-scaled, towing, free flying, and sporting. The sub-scaled segment is estimated to lead the market, as sub-scaled models are cheap alternative to simulate enemy threat instead of using an actual aircraft during training. The adoption rate of sub-scaled target drones is very high in all armed forces across the globe. The geographical analysis of the market covers regions, such as North America, Europe, Asia-Pacific, MENA, and rest of the world. North America is estimated to lead the global target drones market in 2016, owing to the increasing defense expenditure in training programs and the rise in budget allocated for procurement of target drones in the U.S. Lack of skilled and trained personnel to operate and control target drones may restrain the growth of this market. Products offered by various companies operating in the target drones market have been listed in this report. Major players in the target drones market include The Boeing Company (U.S.), Northrop Grumman Corporation (U.S.), QinetiQ Group plc (U.K.), Kratos Defense & Security Solutions, Inc. (U.S.), Saab AB (Sweden), Lockheed Martin Corporation (U.S.), Airbus Group (Netherlands), Leonardo S.p.A. (Italy), ASV Global (U.K.), and AeroTargets International, LLC (U.S.). 14.4 Kratos Defense & Security Solutions, Inc.
14.9 Air Affairs Australia Pty Ltd.